Now that my own urgent medical concerns are out of the way, it's been impossible to ignore the little signs that Abby has been giving me that she may have some minor issues of her own. After a making a couple of observations over the past week and addressing the intermittent complaints that Abby has been lodging, I finally made her an appointment with the pediatrician this afternoon. Since Mia still nurses to sleep and I'm continuing to feel pretty tired and overwhelmed on a regular basis, Tom volunteered to take her. Somehow, despite being delayed by the domino-effect chaos created in the wake of Mia's morning nap-strike, they got out the door just in time. I was worried from the moment that they left, however, since Abby had just recently used the potty and had not had any opportunity to drink anything before their arrival. This was potentially problematic since the very first task to which they were assigned was a lab visit one hour prior to the actual appointment time for a urine sample. 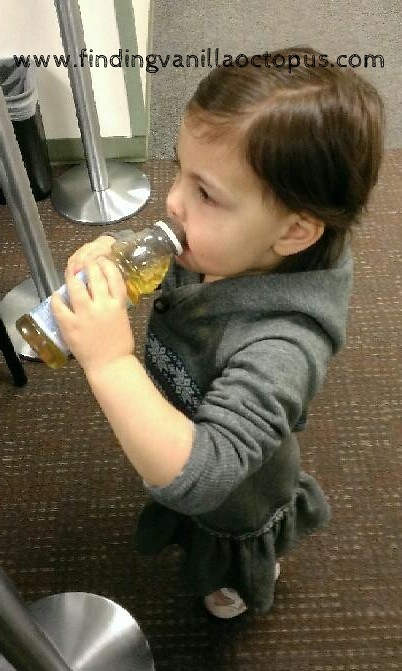 Thankfully, though the little cafe at the medical center was closed, someone was there packing up and was willing to sell Tom a bottle of apple juice. Abby dutifully chugged about half of it down. The hard part was still yet to come, however, and turned out to be more problematic than I had anticipated. Somehow, even though I've been in the lab's bathrooms before, it never occurred to me that they would not have accommodations for young children- no little potties, no little potty seats. Thankfully, though Abby has never in her life used a public bathroom before (or, indeed, a full-sized toilet without a little seat insert), she was a real trooper and ready to try something new just for the sake of the big-girlness of it. It still was not easy. The process required a wait of no less than thirty minutes, and the offering of the last five ounces (of a ten-ounce bottle) as she sat and tried to relax. I give Tom major kudos for catching what he needed to catch- having never attempted such a feat for someone else before- and most of all for being patient enough to get through the ordeal with his sanity intact. In the end, the lab got what they needed and we got the answers that we needed: Abby does, indeed, have a bit of a UTI. She and Tom came home with medicine in hand and I waited nervously to witness what I realized could prove to be the easiest or hardest part of all: the administration of her prescription. It was a thick, pink concoction, and looking at it I could only hope that medicine flavorings had greatly improved since those horrible days in which I had to choke down banana-colored erythromycin, wondering anxiously when I'd finally be trusted with the pill form. Perhaps the pink version of sulfamethoxazole-tmp (say that five times, fast) simply tastes better. Perhaps those flavor additives really have improved. Either way, Abby knocked that stuff back with a smile and followed it with a satisfied lip-smack. Success! It was great to see her looking so proud of herself. Best of all, she'll soon (hopefully) be feeling better, too. Snow and a Haircut- What a Trip!